Rosemary shrub blooming at La Source Parfumee near Gourdon in Provence, France. Photo of Rosemary shrubs at La Source Parfumee near Gourdon in Provence, France in Europe. 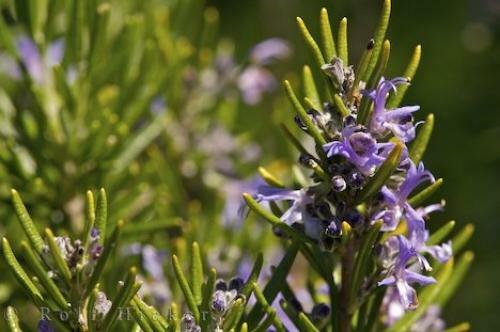 ... Flowering Rosemary shrub, Rosemarinus officinalis, at La Source Parfumee Gardens, 3 kms from the village of Gourdon, Alpes Maritimes, Provence, France, Europe. I photographed this photo with the digital SLR camera model Canon EOS-1Ds Mark II, aperture of f/10.0, exposure time of 1/100 sec. on ISO 100, as always I used a original Canon Lens, the focus lenght for this picture was 180mm.